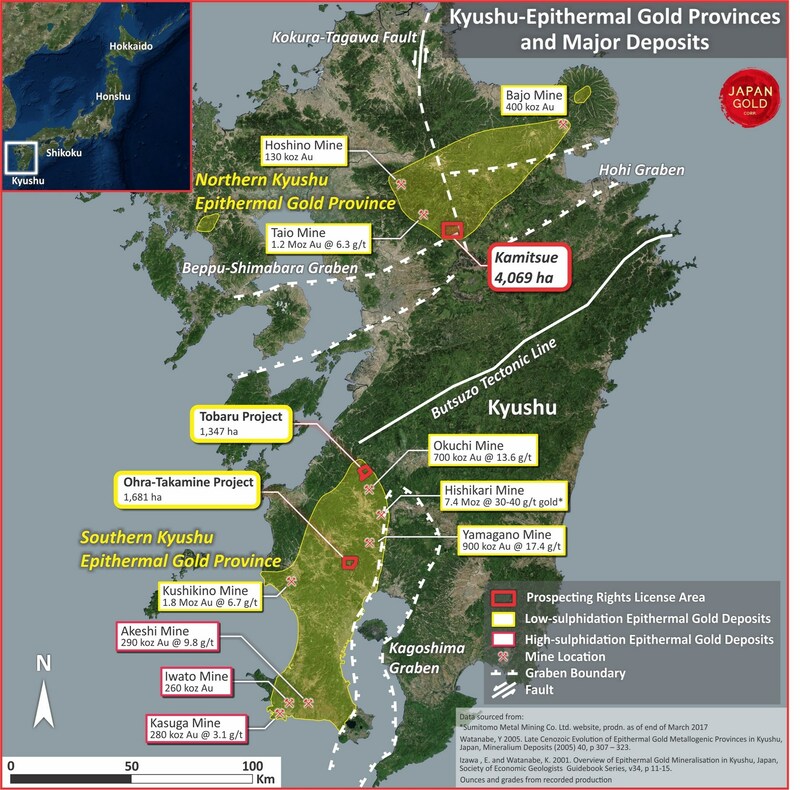 Vancouver, British Columbia - November 7, 2018 (Newsfile Corp.) (Investorideas.com Newswire) Japan Gold Corp. (TSXV: JG) (OTCQB: JGLDF) ("Japan Gold" or the "Company") is pleased to announce that its twelve prospecting rights applications over the Kamitsue Project on the Island of Kyushu, Japan, have been converted to Prospecting Rights by the Japanese Ministry of Economy, Trade and Industry (METI). Japan Gold Corp. is a Canadian mineral exploration company focused solely on gold and copper-gold exploration in Japan. The Company has applied for 216 prospecting rights licenses in Japan for a combined area of 71,529 hectares over seventeen separate projects. Sixty-eight of these applications have been granted as Prospecting Rights. The applications cover areas with known gold occurrences and a history of mining, and are prospective for both high-grade epithermal gold mineralization and gold-bearing lithocaps, which could indicate the presence of porphyry mineralization. Japan Gold's leadership team has decades of resource industry and business experience, and the Company has recruited geologists and technical advisors with experience exploring and operating in Japan. More information is available at www.japangold.com or by email at info@japangold.com.